A head and shoulders pattern is a chart formation that resembles a baseline with three peaks, the outside two are close in height and the middle is highest. 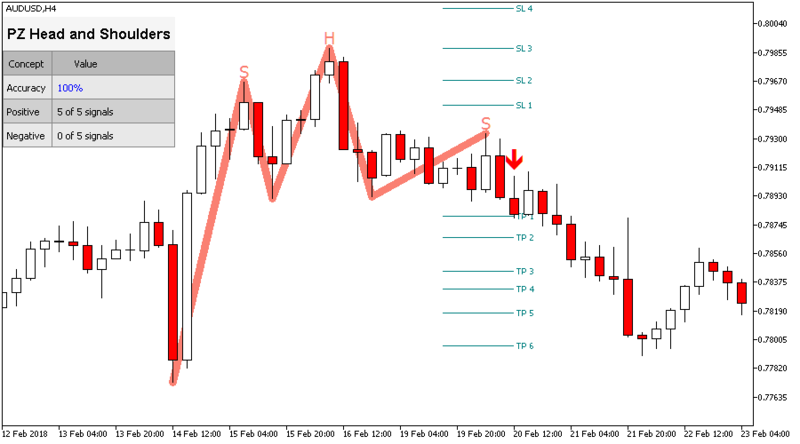 It predicts a bullish-to-bearish trend reversal and is believed to be one of the most reliable trend reversal patterns. It is one of several top patterns that signal, with varying degrees of accuracy, that a trend is nearing its end. The amplitude represents the minimum amount of bars between alternative price points. To find big patterns, increase the amplitude parameter. To find smaller patterns, decrease the amplitude parameter. The minimum fibonacci retracement needed in a pattern. Set to zero not to evaluate it. 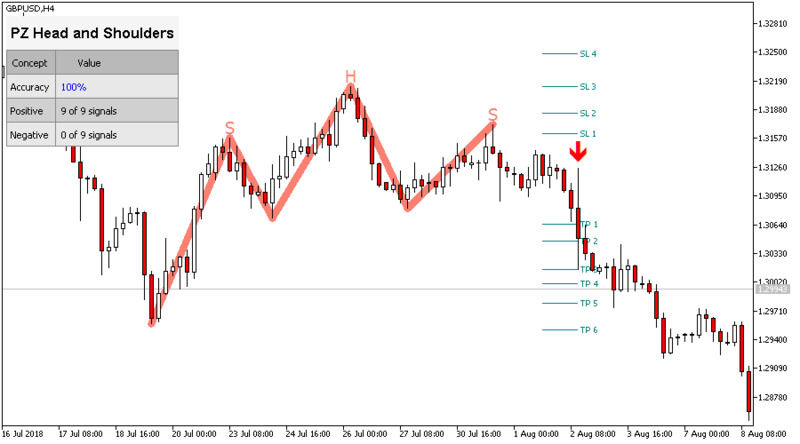 The maximum fibonacci retracement possible in a pattern. Set to zero not to evaluate it. This parameter describes how "flat" must the neckline be relative to the pattern size. A higher value will find stricter patterns, yet less frequent. A lower value will find more patterns. Amount of past bars to evaluate when the indicator loads in the chart. 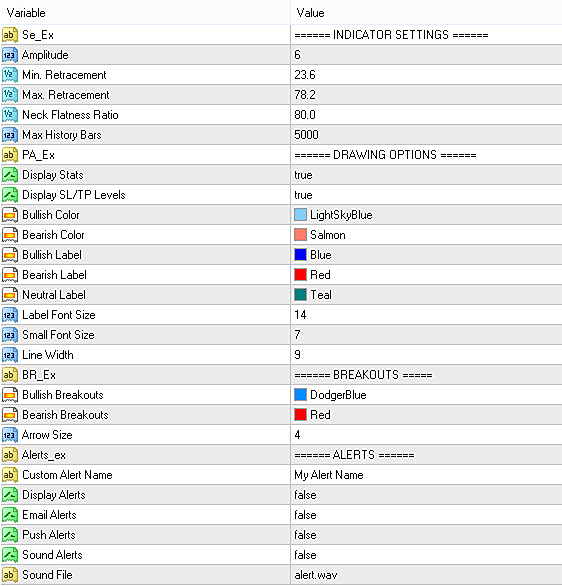 Show or hide the statistics dashboard and performance data. 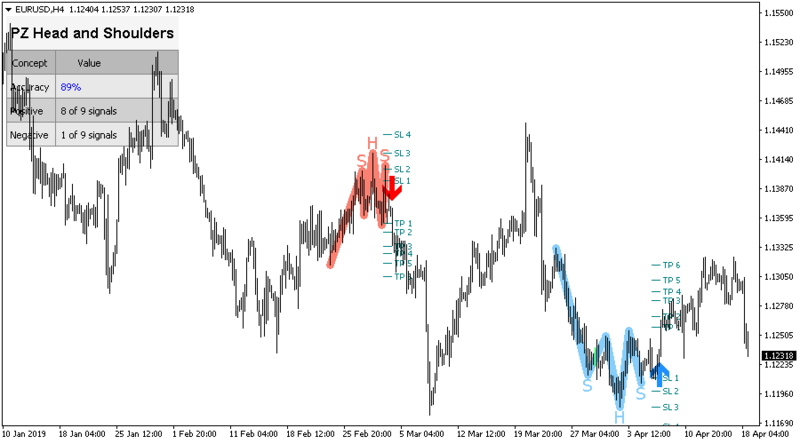 Show or hide the suitable stop-loss and take-profit levels for each signal. 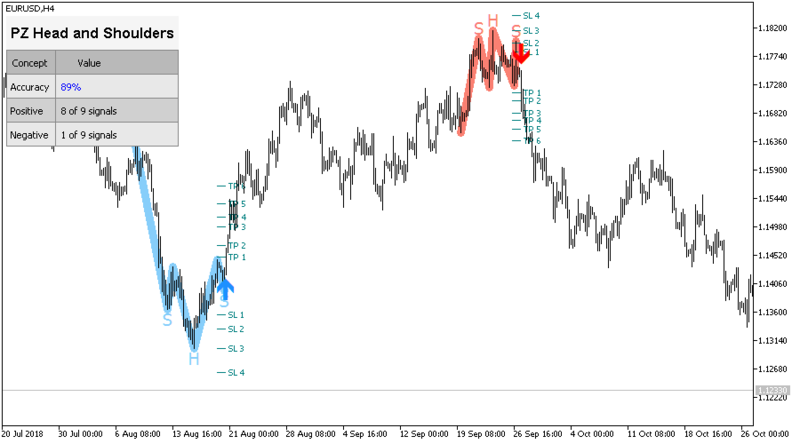 Colors and sizes for bullish or bearish lines and labels, as well as font sizes. Colors and sizes for breakout arrows. Enable or disable alerts at will. No, the indicator does not repaint or backpaint at all. Does the indicator back paint? No, the indicator does not back paint. Can patterns be displayed before the breakout happens? No, it can't. 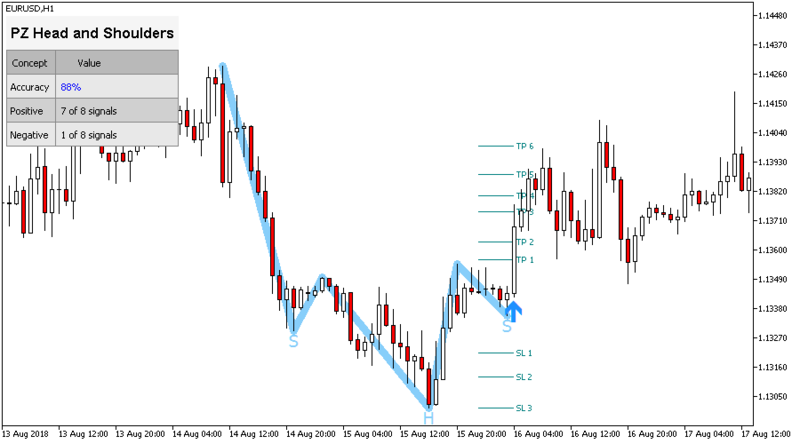 The pattern and the breakout arrow are displayed exactly as the same time, to prevent the indicator from repainting. Does the indicator implement alerts? Yes, it does. It implements alerts of all inds. 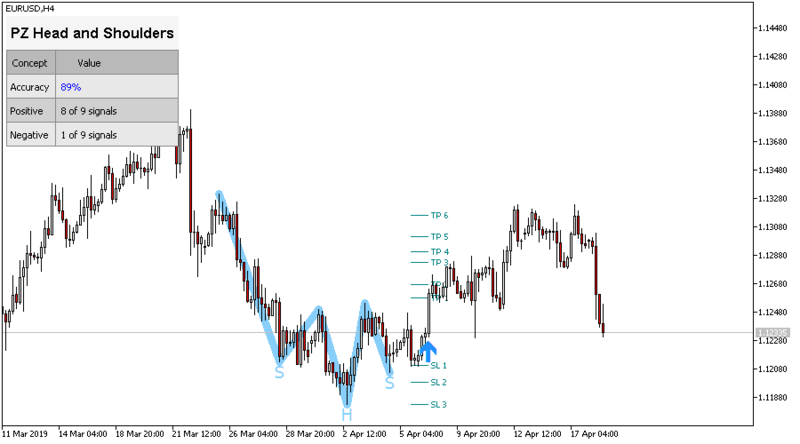 This indicator finds double top and double bottom chart patterns, a must-have tool for price action traders. 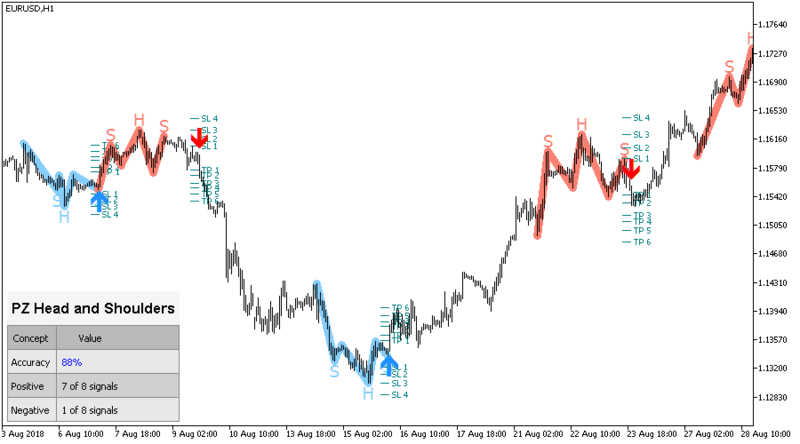 This indicator finds triple top and triple bottom reversal patterns and implements alerts of all kinds. 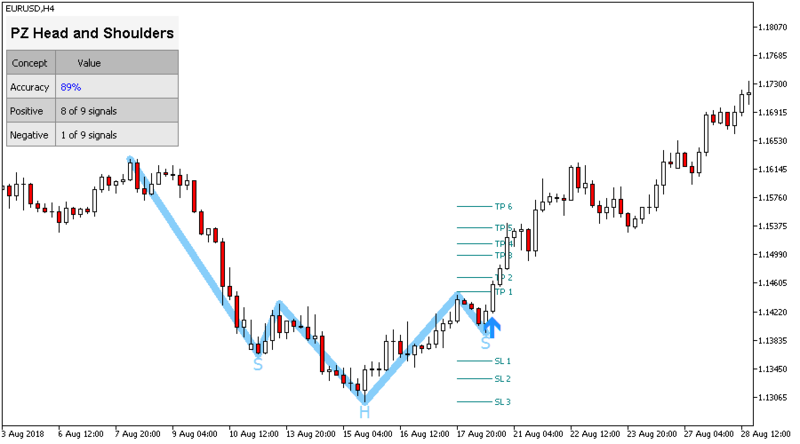 The 123 Pattern is one of the most popular, powerful and flexible chart patterns, present during trends and reversals. Cup and handle is both a continuation and a reversal pattern. The indicator implements alerts of all kinds. This indicator finds pennants, which are continuation patterns, and implements alerts of all kinds. 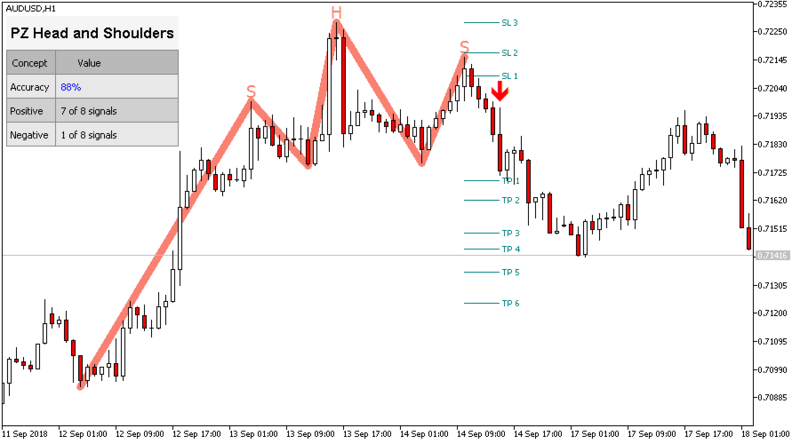 This indicator finds wedges, which are continuation patterns, and implements alerts of all kinds.